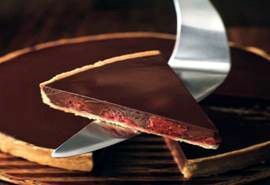 Here is a beautiful and delicious tart made with a lusciously rich chocolate ganache and fresh raspberries. We use a pâte sablée for the tart crust which has a buttery, crumbly texture almost like a cookie. Reprinted with permission from Desserts by Michel Roux (Wiley 2011). On a lightly floured counter, roll out the dough to a circle, 1/16–1/8 inch (2–3mm) thick, and use to line an 8 1/2-inch (22-cm) tart ring, 1 inch (2.5cm) high, placed on a cookie sheet Chill for 20 minutes. Preheat the oven to 375°F/190°C. Prick the dough base lightly with a fork. Line the pastry shell with waxed paper, fill with baking beans, and bake “blind” for 20 minutes. Remove the paper and beans, lower the oven setting to 350°F/180°C, and bake for 5 minutes. Transfer to a wire rack, leave until cool enough to handle, then lift off the ring. Once cold, arrange the raspberries in the pastry shell, pressing them down lightly with your fingertips so that they stick slightly to the base. For the ganache, slowly bring the cream to a boil in a pan over medium heat. Remove from the heat and add the chocolate, using a balloon whisk to mix it in, then add the glucose. Once the mixture is smooth, incorporate the butter, a little at a time. Pour the ganache over the raspberries to fill the pastry shell. Let cool, then chill the tart in the refrigerator for at least 2 hours, before serving. Use a very sharp knife dipped in boiling water to cut the tart into slices, wiping the knife between each slice. Serve cold, but not straight from the refrigerator. Heap the flour in a mound on the counter and make a well. Put the butter, confectioners’ sugar, and salt. With your fingertips, mix and cream the butter with the sugar and salt, then add the egg yolks and work them in delicately with your fingertips. Little by little, draw the flour into the center and work the mixture delicately with your fingers until you have a homogeneous dough. Using the palm of your hand, push the dough away from you 3 or 4 times until it is completely smooth. Roll it into a ball, wrap in plastic wrap, and refrigerate until ready to use. If well wrapped, this delicate, sweet pie dough will keep in the refrigerator for up to a week, or in the freezer for up to 3 months.